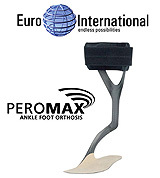 The Peromax Carbon Fiber AFO is an excellent recovery device for peroneal paralysis patients. Its carbon-fiber design allows for high energy return and is rated up to a maximum weight of 275 lb. The Peromax is also used for the rehabilitation of Achilles tendon injuries. For more information about the Peromax, please visit us at Academy booth #249-253 and 292-296! Lower Limb Technology LLC introduces you to expert craftsmanship in custom lower- and upper-extremity fabrication. We have an alliance of certified orthotists, prosthetists, and technicians manufacturing precision orthotics and prosthetics you can count on. Manufacturer of lower- and upper-limb orthotic and prosthetic products. We are a central-fabrication company. Highest quality of fabrication and production of custom orthotics and prosthetics. Test sockets to final fabrication. Lower Limb Technology LLC/Spinal Technology, Inc. The ALPS Extreme Liner has been specifically designed for both transfemoral (AK) and transtibial (BK) amputees, reducing your on-hand inventory costs. The Extreme Liner eliminates 80% of vertical stretch, resulting in increased contact while reducing movement of redundant tissue and substantially eliminating pistoning. It features ALPS' new GripGEL™ to gently but firmly support the residual limb and sensitive tissues. Limited vertical stretch reduces movement of redundant tissue. High circumferential stretch to assist with form fitting. Wider distal end for ease of donning. Provides more control and stability. Available in 3mm and 6mm uniform thicknesses in eight sizes. 1-year warranty, 2-year on two liners. Intended for patients up to 320 lb. or those individuals with a severe biomechanical deficit, the Model 1017-A38 Automatic Angled Lever Lock Knee Joint is the latest addition to our comprehensive range of orthotic knee joints. Equipped with in. x ¾ in. (9.5mm x 19.1mm) aluminum uprights, the Model 1017-A38 is modular in design and may be used in either a unilateral or double upright configuration. The Model 1017-A38 can be fabricated into a variety of orthotic designs including conventional metal and leather, thermoplastics, and composites. 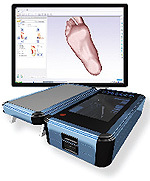 The Seattle Kinetic Foot is the perfect solution for moderate K2 ambulators. Indicated for low- to moderate-activity amputees with a maximum weight of 136 kg/300 lb. Advanced design for amputee'severyday needs. Male bonded pylon and female foot adapter included. The inherent rigidity of the FullStride Shadow ensures that optimal joint alignment and function is maintained throughout the gait cycle. Constructed of lightweight and rigid composite materials, the FullStride Shadow's sleek and open design offers patients an unparalleled blend of form and function. The NINJA belt is the foundation of each brace (L-0627, L-0631, and L-0637) in the NINJA Progressive Spinal System. It has a soft mesh inside and an aggressive loop outside. 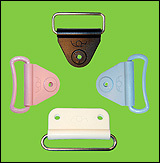 The single pull strap is easy to tighten and fasten. The NINJA LSO is pictured. With an SPS purchase* of either two DuraGel liners, two Low Activity liners, or three Siloliners, you will receive a navy scrub shirt with your name and credentials embroidered on the front. Two lines of embroidery may contain any combination of letters/punctuation/spaces within a maximum count of 17 per line. SPS customer service will complete all paperwork required at time of order. Promotion runs from February 1-June 30, 2010. Four-week lead time from order placement to receipt at facility. * Qualifying quantity must be placed on a single purchase order. Synthetic tape at plaster prices! Tired of getting plastered by casting tape prices? Our new synthetic casting tape provides greater strength and comfort due to its enhanced stretchability. Our tackless resin formula allows for easy handling. It comes in an easy-to-use "easy-open" pouch. The green color will also tell you that it's an environmentally friendly, disposable product. Unbelievable quality at an unbelievable price. Let our green tape save you more "green." Check out our catalog for our new introductory price. Ultraflex toe pads are available for purchase individually or with Ultraflex customfabricated orthoses made in the Ultraflex Lab. Ultraflex toe pads are an ideal addition for neurologically involved patients. They come in extra small ( 2 3/8 in. ), small(2 3/8 in. < 2 5/8 in. ), medium (2 5/8 in.< 2 15/16 in. ), and large (2 15/16 in.< 3 1/8 in.). Ultraflex toe pads are recommended for use with Ultraflex Adjustable Dynamic Response™ UltraSafeGait™ for managing gait deviations. Now through March 31, 2010, you can try the new Summit™ 631 LSO for 15% off when you place an order for it with SPS. The Summit 631 is a pain-relief option that offers a therapeutic level of motion restriction and provides effective compression for the relief of low-back pain. Conform back panel provides custom-silhouette feel while administering direct pain relief to the lower back. Ergonomic, comfortable fit to accommodate diverse anatomies and diagnosis. Four sizes accommodate waist circumferences of 26-60 in. The Helix3D Hip Joint takes advantage of a groundbreaking design to create a more natural, three-dimensional hip movement. Its polycentric shape, in combination with a unique stance-phase control system, also helps initiate swing phase and improves toe clearance and hip-joint extension. The results for your patient are dramatic-your patients may experience less energy expenditure when walking with Helix3D, and their gait will be more natural and confident because of the added stability provided by use of the C-Leg® microprocessor knee. 50° ankle range of motion gives the Motionfoot™ a great comfort advantage and superior stability on flat, sloping, or uneven ground. The hydraulic ankle allows adjustment of the resistance by the wearer in both plantarflexion and dorsiflexion. The prosthetist can also adjust heel height and toe stiffness. Visit booth #358 at the Academy Annual Meeting for more information. Orthomerica Products Inc. introduces the new California® LOMBAR™, a streamlined, low-profile, customizable orthosis that promotes thoracic extension through targeted vertebral separation. The "aluminum spine" provides strength while conforming intimately to the patient's body to provide stability and pain relief. Contoured spine can be further customized with no tools. The apron front closes with Velcro® via dual pull tabs with finger pockets for easily controllable, adjustable abdominal compression. Visit our website to view Orthomerica's California LOMBAR or any of our comprehensive array of prefabricated, semi-custom, and custom orthotic products. Orthofeet is adding more great-looking mod­els to its Tie-Less shoes collection. These innovative, patent-pending shoes com­bine laces with hook-and-loop straps, allowing users to wear regular lace-up shoes without needing to tie them. Soft, seamless fabric lining, padded with foam. Lightweight Ergonomic Stride™ soles with functional Toe-Spring. The Becker Rotation Adjustable Elbow Orthosis (BRAE) is designed for the management of forearm rotation contractures using a static progressive stretching protocol. 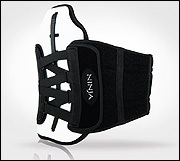 The orthosis is useful for treatment of forearm contractures as a result of upper-extremity fractures and injuries. Forearm rotation is adjusted by means of a dual offset channel with a patented overlapping adjustable rotation component. The most popular Alpha Liner. The most popular gel thickness. The most popular gel profile. The Alpha® Original MP Liner. Six-millimeter gel thickness, uniform style, and original green/gray fabric are the specifications for the Alpha Original MP Liner. This is the most popular Alpha Liner from Ohio Willow Wood, at a new, lower price. Ohio Willow Wood provides real solutions for practitioners and their patients. Take your pick from six favorite designs with each SPS purchase of the new 980-HD Quick Disconnect, now through March 31, 2010. Redesigned 980-HD allows one section of an orthosis to disconnect fromanother with a simple push of a button. Builds modularity into any orthosis and facilitates removal or addition of sections of an orthosis as patients' needs change. Applicable to cervical, spinal, upper- and lower-limb orthotics. Choose between Military Camo (P-1025), Fly and Drive (P-1014), Carbon (P-1063), Purple Butterfly (P-1026), Sweetheart (P-1072), or Tattoo (P-1069). Transfer sheet size is 40 in. x 60 in. Friddle's Vacuum Forming Hose is now available in three sizes and packaged in 5 lb. bags and 50 lb. bulk boxes. All hose are first quality, no seconds. Each one has a sewn toe. All hose are leggings only, no pantyhose. They are excellent for final laminations, and they are available with or without release agent. There are approximately 105 regular-sized hose per 5 lb. bag. Model 1013 is a posterior offset adjustable knee joint that allows the orthotist to fine-tune the A-P alignment of the knee. These features enhance knee stability and help broaden the clinical application. The A-P alignment and the extension/flexion angle can be changed by simply removing two screws; this allows easy adjustability without the need to physically alter the angle of the uprights. The Model 1013 comes equipped with an optional bail lock that can be engaged when the patient reaches full extension. KiddieGAIT™ offers a carbon-composite framework that allows you to build an orthosis that encourages functional heel-to-toe gait. Up until now, about the youngest kids you could fit with KiddieGAIT were ages three or four. The three new "baby" sizes are smaller. The goal is to support the foot in early stages and beyond, to stimulate and assist the child to stand and toddle, providing the support for correct functional posture and gait. 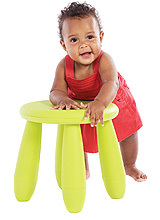 You will now be able to fit KiddieGAIT on kids from about nine months to approximately nine years. Easily adjustable vacuum and lightweight. Stop by table #320 at the Academy meeting in Chicago. The Spectracarb-Aralon™ Stockinette is just what the practitioner would order. Easy workability, strength, wets out well, and fatigue resistant. Lightweight, contours superbly, no delaminating. People-friendly material: mitigates skin irritation. Tubular goods facilitate ease of usage. Available in 5-yard and 25-yard rolls. Half the cost of carbon material. Can be modified using a heat gun without delaminating. The innovation leader in knitted orthotic and prosthetic products.